a fold down pouch bag by kaeken. great for cosmetics, art materials, clothing even diapers for your baby! velcros attached on the sides of the bag so you just need to fold the edge down like a paper bag to seal. you can carry it as a clutch bag or put it in your large hand carry bags. 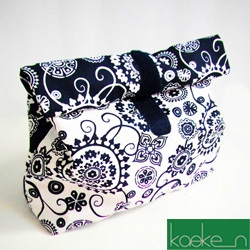 check out more of kaeken's bags!